karen fatima franciscolightswitch publishingreevreev robledou.p. After 8 years with Broadcasting majors at the college of Mass Communication in University of The Philippines Diliman, I am rewarded with one of the best seasons in my teaching career. Seen in photo is the BC101 (Audio Production and Direction) Friday class. Now I have no idea why they did this but it was really sweet! Here’s their special performance on my last day of teaching. In this indie suspense-thriller, a young co-ed is stalked by a boy trying to win her affections. While in campus, a series of eerie events occur that unravels a horrifying discovery. I lent some previous music scores for my students to use in their indie film. I thought this project was really well made! It did scare me too. Well done guys! Produced by Broadcast students of the University of the Philippines College of Mass Communications. A pop album featuring singer-songwriters Myka, Peter, Chrion, Ceres and Lee. Produced by U.P. Broadcasting students. “Yes! We can do it!” is an innocent response that entails a whole gamut of experiences four generations of BC 106 broadmajors have gone through. It’s an emotional ride surely not for the faint of heart. Keeping up with current music trends, “Soloista” was a pure marketing success (thanks to Multiply, YouTube and Yahoo!). Even though the album carries a roster of talented singer-songwriters, the CD actually didn’t sell. But audiences and sponsors loved the whole concept. So how is the fourth time around any different? Not much. Ambitious. Yes. Dramatic. Yes. Expensive. Absolutely. Fun. U-huh. Successful. Of course. Would we do it again? Hmm. Suffice to say, this fourth outing is a culmination of the past successes and failures of previous albums and still earns its rightful place in BC106’s Hall of Fame. It’s time for this elective to evolve. Take a bow, everyone. Original music score and sound design. An alternative album featuring bands Deltajoy, Delinquentres, Up Dharma Down and Pope. Produced by U.P. Broadcasting students. An acoustic album featuring bands White Noise, Pandora, Kiko Machine, Lady Bedspacers and Blue Note Funk. Produced by U.P. Broadcasting students. 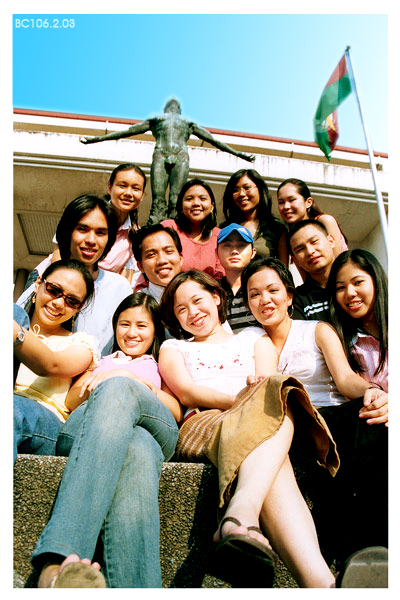 The very first album production of broadcasting students in the College of Mass Communication in U.P. 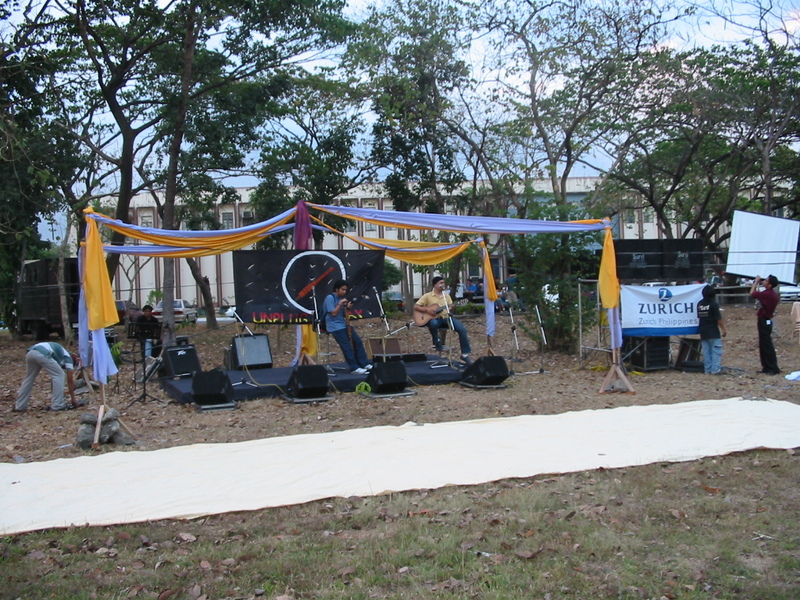 Diliman. 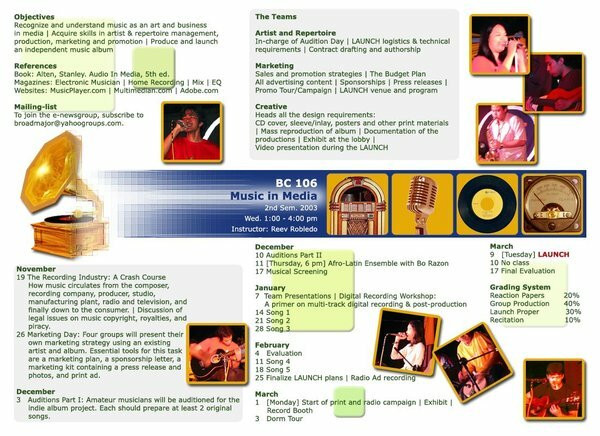 Under an elective called BC106, the goal of the course is to exploit music as an art and business. Unplug `N Play is an album of unplugged performances composed of unsigned bands. From almost 20 auditionees, 5 bands emerged as worthy candidates: White Noise, Pandora, Kiko Machine, Lady Bedspacers and Blue Note Funk, each with their own musical identity. The birth pains included off-sync recordings, headstrong artists, marketing woes and internal chaos. However, the project was financially successful with its break-even finish, and set the foundation for future BC106 productions (ReStrung in 2004, Classicology in 2006 and Soloista in 2007).